Jeanne died peacefully in our home on a Thursday afternoon at around four-thirty. She was actively dying for about 24 hours - eyes closed, unresponsive, weak pulse, cool hands and feet, disorganized breathing - slow fast, deep shallow, quiet loud. She was in bed for eleven days, and until the day before engaged in ways I hadn’t seen for years. Her cognitive impairment disappeared. Terminal lucidity. Our home was a special care unit for a single patient with an on-site staff of three and the support of a well-established non-profit hospice agency from an adjacent town. I started sharing caregiver duties in September - first with our daughter, and then a private caregiver - both capable, compassionate, and essential. 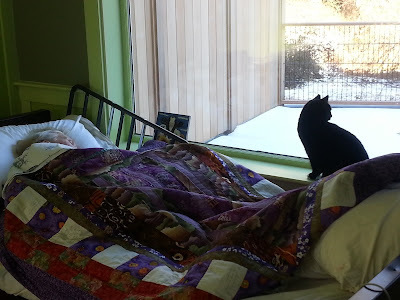 Hospice joined us mid-November. We told friends and family Jeanne could no longer receive visitors. Time awake was infrequent and unpredictable in the company of a very small circle, all directly contributing to Jeanne’s care, and ours. We had an awesome aide from hospice, and the rest: nurse case manager, back-up nurse, social worker, chaplain. Those last double-teamed us that final Wednesday. The chaplain visited Jeanne while I joined our daughter in the living room with the social worker. Twenty minutes later, they switched places, and we talked with the chaplain while the social worker sang to Jeanne. They left, and we lowered the head of Jeanne’s bed for routine care: turn her to a new position, check her skin, make sure the inside of her mouth was moist, etc. Ease back onto her pillow, unfocused stare, slipping away. We stay, sit close, watch, doze, listen, wait. The funeral director and assistant place Jeanne in a body bag and onto a stretcher. I follow to the driveway, watch them slide her into the same discreet black minivan we will use for the trip to Maine. They drive off. I bow low, and go back inside to figure out next steps with the kids. I break down completely at the greenhouse on Friday, starting to explain why I'm there. They respond kindly. I leave feeling relieved and saddened. To the funeral home. The director and assistant waiting with Jeanne’s body. She's dressed in a kelly green t-shirt with a small guitar on the front and the phrase, “Shamrock on;” navy blue slacks; a pair of cream colored socks decorated with the birds we enjoyed watching in our backyard - black-capped chickadees, blue jays, cardinals, yellow finches; a navy blue cardigan sweater with tiny white stars and a small round pin, “I am loved.” The pin was given to Jeanne on Valentine’s Day two years earlier at the adult day care program. She wore it almost every day. We place her body in a linen shroud, wrap and tie it closed, cover her with a special quilt, and slide the flat wooden stretcher into the discreet black minivan. The assistant bundles the lilies in the shroud’s former wrapping paper, places them to either side, and closes the door. I drive, my daughter rides shotgun. The funeral director and assistant follow in one car, my son and his wife in another. We're joined at the green burial ground by the caretaker, Gary. My son, daughter, daughter in law, and I remove the quilt and carry Jeanne’s shrouded body to the freshly-dug grave. We lower her gently onto pine boughs lining the bottom, surround and cover her with lilies. The forest is quiet and cold. We take turns saying goodbye. I pour seven glasses of home brewed beer. The funeral director reads Saint Brigid’s prayer. We toast Jeanne. Now, the most difficult and important part - leaving. Gary will care for her. A few days later, at the funeral home paying the bill - just under $5,500. I hand a check to the assistant, and ask for Jeanne’s wedding ring. Silent curse - why didn't I just take it off at home myself in the first place? I leave, unsatisfied and angry. I say, you say, end of story. Consider everything that can go wrong, or could have. This lost wedding ring seems trivial. I don’t think the funeral director or assistant stole Jeanne’s ring. That would be petty, and discouraging. But, what happened? When they left our home, did they really bring her back to the friendly local funeral home? Or, did they head over to a light industrial/warehouse district just off the interstate, filled with nondescript buildings we pass without a thought, including one where armies of technicians working around the clock process dead bodies for some large heartless corporation? I know that might sound a little crazy, maybe a little too much like the climactic scene in Solyent Green (***spoiler alert*** Solyent Green is people). I guess it does sound that way when I read it out loud. But the contemporary funeral industry has always creeped me out. It’s dark, secretive, and pernicious. I don’t have specific evidence, just intuition, childhood memories, every episode of Six Feet Under, news reports about companies playing in that sandbox (gravesite? ), and some important work by the good guys. But it’s the only way I can get my head around the lost wedding ring. I think Jeanne was brought to a nondescript building somewhere off the interstate, where the ring was promptly found and pocketed as she was un-bagged and passed down the assembly line, or lay at a station. I think she was washed, dressed, and stored there until some time before Sunday morning. I think the friendly neighborhood funeral home is one of many operating this way. There is no friendly neighborhood funeral home. That's the creepy secret. It seems to me the funeral director or assistant would have made such note, had they done anything more than drop her off and pick her up some time later, ready to go. This was quite beautiful and compelling. I am so sorry for your loss, but I thank you for writing this. It means something.